Anderson, Carl and Rev. José Granados, Called to Love: Approaching John Paul II's Theology of the Body (Image, reprint edition 2012). The family is at the center of many of the problems our society is called to address today. These problems refer first of all to the human person’s search for his identity: Who am I? Is my life worth living? Does love provide an answer to my questions and open up a road to fulfillment? If so, how is one to differentiate true love from an illusory one that only leads to unhappiness? To these questions we can add others that do not refer only to the sphere of intimate relationships, but affect also the life of man in society. What is the value of the family for our society? Does the family have a mission in the building up of the common good, in the education of children, in the happiness of man and woman? During his pontificate, John Paul II tried to illuminate these questions. His message consisted in proclaiming the Gospel of love and the Gospel of the family, the place where true love is born and fostered. The family was among Karol Wojtyła’s concerns as a young priest and continued to be the main focus of activity during his pontificate. This same approach has been pursued by John Paul’s successor, Benedict XVI. Benedict declared at the beginning of his pontificate that he did not expect to write many documents; instead, he conceived an important part of his mission to be making John Paul II’s own writings better known. Consonant with this work, Pope Benedict’s first encyclical, Deus caritas est, addressed the very problem to which John Paul II had devoted the Wednesday catecheses now know as the Theology of the Body: human love in the divine plan. In this way both pontiffs have pointed the way for the Catholic Church in the third millennium. John Paul II affirmed at the beginning of his pontificate that “man”—the human person with his hopes and joys, fears and troubles—has become “the way of the Church.” The Theology of the Body further specifies this claim by saying that the way of man is the way of love: man can only find his own fulfillment if he loves in truth. Thus, the Church’s mission consists in proclaiming the truth about love so that the human being can attain fulfillment. How is this possible? How can the Church point out the way of love? The Theology of the Body shows how the family is the place where true love is attained. John Paul II invited the Church to follow the way of man, the way of love, and to help build a whole civilization of love by strengthening its most basic unit, the family. From this perspective it becomes evident that the Theology of the Body cannot be reduced to a doctrine about sexual morals. Its scope contains the whole explanation of the Christian message in terms of love, thus providing a right understanding of God, man, and the world. Let us consider this in greater detail. a) First of all, the Theology of the Body offers a right understanding of the human person. Man is called to love and can only be happy if he discovers true love. The Theology of the Body helps man discover the truth about his path of love. Man appears―in his bodily existence―as a being open to the world, others, and to God—a being whose vocation is realized only if he accepts himself as a gift and is able to give himself in response to this gift. b) Secondly, the Theology of the Body is crucial for the understanding of the Church’s mission in the world. This theology, indeed, offers a complete vision of Christianity: Christianity is all about the revelation of God’s love for the world in the bodily life, death, and resurrection of Christ. Only if such an account is provided, does the message of the Church address the real concerns of the human person. c) Thirdly, the teachings articulated in the Theology of the Body are crucial to grasping the meaning of man’s life in society. Once man has understood that he is called to love, he realizes that he cannot keep this vocation to himself, but is called to build up a civilization of love, the society that emerges from love as articulated by John Paul II. The book Called to Love: Approaching the Theology of the Body gives an account of the Theology of the Body by indicating the path along which man learns to build up his life in love. The Introduction focuses on the question of man’s identity, the quest for his own self. How are we to understand man’s mystery, the greatness of his dignity and vocation? John Paul II indicates that the way is not far from us. “It is not up in the sky, that you should say, ‘Who will go up in the sky to get it for us and tell us of it, that we may carry it out?’Nor is it across the sea, that you should say, ‘Who will cross the sea to get it for us and tell us of it, that we may carry it out?’” (Deut 30:11–12). On the contrary, it is offered to us in the simplest of everyday events: the experience of love. John Paul II refers precisely to the experience of love, understood in its fullness, as the way to answer the question of man. The book wants to help the reader find his bearings on this path of love. The first part, “Encountering Love,” describes the original experience of love. At this point the human body is pivotal: the body, indeed, identifies the person precisely in his encounter with the world and with others. Thus, to understand the person from the point of view of the body means to avoid the danger of solipsism from the very beginning. Man, in his bodiliness―through his senses, expressions, gestures―is a being defined by his encounter with the world, with others, with God. From this point of view it is possible to grasp the meaning of the sexual difference, of masculinity and femininity. Because the human body belongs to the identity of the human person at the very deepest level, the sexual difference between men and women reveals the meaning of their identity: in their difference, they are called to unity. Inscribed in my very being, at the center of my identity, is a call to love the other person; because of this, I can only be myself if I accept this person and I give myself to her. This call, precisely because it is inscribed in our bodies, can be seen as a vocation given to us by the Creator, the original source of love. Rooted in the first gift—the gift of creation—man is able to give himself freely in return, building up communion with the other person. Only at this point can we understand the full meaning of the creation of man, male and female, in the image of God: the communion of persons is the image of the Trinity, a God who is in himself Love. But it is not enough to encounter love and to understand its meaning. It belongs to the very essence of love that it grows in time, that it needs to be strengthened and purified. The second part of the book deals with this “Ascent of love.” We begin by describing the fragility of love and the difficulties it finds along its path. From this analysis, a question arises: is it possible to build up lasting love in our life? In answer to this question we present the figure of Christ as the one who at once purifies love and brings it to perfection. Christianity consists of the gradual revelation of this love (in the Old Testament), which attains its fulfillment in Christ. In the life of Christ, the Son of God who gives his life in order to purify the Church and receive her as His bride, we find the retrieval and the fulfillment of the original experience of love. It is in gazing at the life of Christ that we understand that he is not alien to the human experience of love, but belongs to its very foundations from the beginning. Having witnessed and received this fullness of love, man can accept the task of rebuilding love. The second part offers an account of this task, the education of love, which John Paul II also calls a “pedagogy of the body” and which consists in an integration of all the dimensions that love reveals in our life. In the third part of the book we deal with the love that comes from the fullness of love revealed in Christ: it is the beauty of love, the splendor of the body. This splendor comes to maturity in the sacrament of marriage and also in the vocation to virginity, which allows us to speak of the heavenly destiny of the body. The last chapter deals with the openness of the family to society and the family’s mission to help to build a civilization of love. --The book will help the reader to understand man’s vocation and quest for self identity. It will serve in a special way to assist engaged couples preparing for marriage, married couples who want to strengthen their family, and also consecrated people who want to live their vocation in fulfillment. --The book will also be helpful for pastors, since it provides an account of the mission of the family within the mission of the Catholic Church. --A right understanding of the place of a Christian in society will be fostered in the reading of this book, which shows that questions about love and the family are not just private ones but crucial for the flourishing of the whole community. --The book also examines John Paul II’s understanding of Christian faith in its entirety. A theology of the body appears as the root of Christian theology, because it provides a Christian interpretation of the world in the light of love. Rev. José Granados is the Vice President of the Pontifical Institute of John Paul II (Rome) where he is also a professor of dogmatic theology of marriage and family; he is also a visiting professor at the Pontifical Gregorian University. In April 2013 he was appointed by Pope Francis as a consultant to the Congregation for the Doctrine of Faith and in March 2014 as a consultant for the Secretariat of the Synod of Bishops. 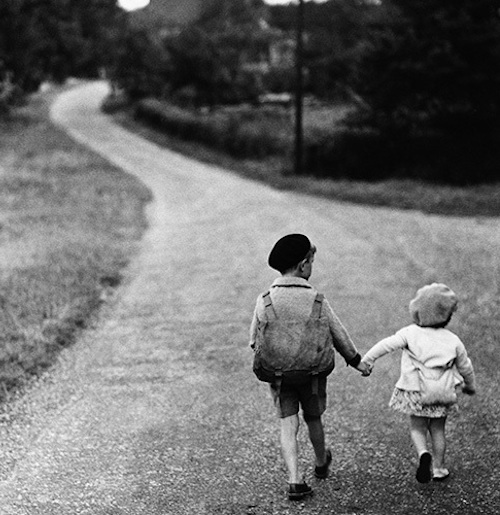 Hand-Holding Children on English Country Road. Copyright, Hulton-Deutsch Collection/CORBIS.